Dr. George Rosenbaum moved to Boulder City in 1978 and practiced with Dr. Eldon Clothier. In 1979 he opened his current practice at 899 Adams Blvd., in front of the Boulder City Hospital. Born in Las Vegas, Dr. Rosenbaum attended local Las Vegas schools, and graduated in 1978 from Loyola Dental School of Chicago. Dr. Rosenbaum returned to Nevada as an officer in the Navy, running dental clinics for the Indian Health Service in Northern Nevada. During this time he met his wife, Wanda, a civilian nurse at the Walker River Indian Reservation. Dr. Rosenbaum began his family practice with all the traditional dental services. With her nursing background, Wanda instituted an infection control program early in his career. As the years progressed, this program expanded into a quality safety program for dental health care team members and patients. In 1998 Dr. Rosenbaum attended the Las Vegas Institute to study Cosmetic Dentistry expanding his practice to Comprehensive Cosmetics. Using the latest technology, he combines creativity and dental science to transform the form and function of the teeth. The primary goal of his practice is maintaining the patient’s healthy teeth and gums while improving their smile. A member of the American Dental Association, in 2001 he became an officer in the Southern Nevada Dental Society and became President in 2003. He is currently Vice-President of the Nevada State Dental Association and will become President in 2007. He is an alternate delegate from Nevada for the American Dental Association and a member of its Council of Government Affairs. The Dental Health Care team initiated various monthly volunteer projects such as their yearly food and toy drive. The team provided dental care for people unable to afford the cost of dentistry. Dr. Rosenbaum is still aspiring to improve his practice by his attendance at continuing education programs. 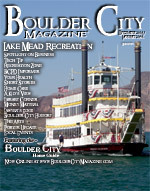 Living and working in Boulder City for 27 years Dr. Rosenbaum has seen up to three generations of families. His patients refer most new patients as an unsolicited testimony to his ability to provide superior care. Always striving for improvement, Dr. Rosenbaum is always open to learning new techniques and strategies for providing the best care for patients. Call 293-0373 or visit us online at drgrosenbaum.com.